Super Wonder in Toronto’s Little Italy provides pedestrian traffic of 6,000/day and 14,000/day vehicle traffic. We work with you to help create live music, corporate events, art showcases, theater, fashion runways and awesome parties. A versatile, raw, and open space with 14 ft. ceilings and over 2500 sq.ft. 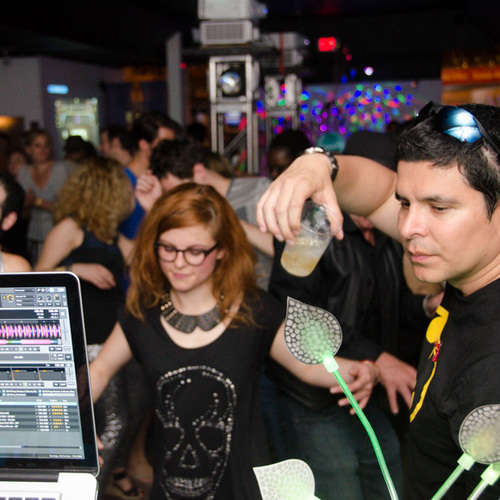 on street level has hosted all types of events. 200 people standing or up to 110 people seated. Space is also divisible with curtains, or movable walls, to create personable and manageable spaces. Ready for custom weddings and over-the-top events, the gallery, at 584 College St is conveniently located 450m West of Bathurst St. The 506 Streetcar delivers TTC riders to our front door. Parking is available on the street or a municipal parking lot. Reserve space for your day or night event. 2400 Sq ft of adjustable space in Toronto’s Little Italy provides the vibe and visibility. We work with people and help create live music, corporate events, art showcases, theater, fashion runways and awesome parties. Our large venue is perfect for hosting parties and events ranging from live music, dance, theatre, pop-ups and corporate functions..
We organize and curate out of this world themed art exhibitions with 100+ artists each show, that are an incredible and fun experience.